Early in 2015, the thought of having a new comic-related event in Salem was brought-up to a group of individuals. They worked to come-up with some amazing ideas to make the event stand-out from others. And one man was the driving force behind this idea and made it a reality. That man being Casey Ocupe. Casey had a vision, and stayed the path to watch this dream become a reality. With a TV show on local public access, Casey worked to bring the idea and several of its participants to the forefront of the area. Well before the actual event, there was also a session of Comic Talk's where many of the local artists came to talk about what they did. And thus Northwest Comic Fest was born! As my loyal readers know, I run a non-profit to raise money for the American Cancer Society called Comic Book Covers 4 Cancer. From the original planning session, Casey offered me a table at the event to help promote our cause... free of cost. 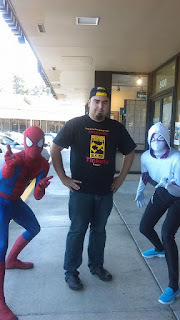 This was of great benefit to us since we had recently been getting some extra local attention from the local newspaper and Casey had me on his show; Northwest Comic Show. I hadn't done an event like this ever, and the last time I had a table at any event was about 10 years ago at the Portland Comic Book Show. I had big dreams, but little funds. Unfortunately, I had been laid-off from work in 2014 and didn't have a steady income in which to fund our appearance at the event. Fortunately, through the generosity of Royce, the director of the upcoming Eugene Comic Con (EUCON), we were able to afford table banners, brochures, ink and paper for making prints to sell at the event. Everything was lining-up perfectly... and then, a few days before the event, I receive a call from Casey. I wasn't sure what to think when I saw his name come-up on my cell phone. Happily, he offered to upgrade the table that he was giving us to a booth on the second floor. I was amazed! Thanks to the help of some of the greatest friends a man could ever have, Scott and Rita, we were able to put the booth together in almost no time. This would be Scott's first time being a participant/vendor at an event like this. Rita helped me a couple times in the past at the previously mentioned Portland Comic Book Show. Without their help through the entire weekend, I don't think I could have made it. I owe them a great deal of thanks. As luck would have it, our booth was right next to a friend of mine, Benjamin Kreger of Warrior Innkeeper Creative. This really helped to make the time more pleasurable and helped to keep my mind of the people that simply passed-by the booth without a second glance. As luck would have it, the first day of the event was also the opening for Benjamin's Kickstarter campaign for his comic, Black Suit of Death. Being the first year for this event, there were some minor issues such as people not knowing that there were 2 floors and the occasional volume on the microphone. These are to be expected. There were a few empty tables and booths up on the 2nd floor, and this was a little disconcerting... especially when one of those booths was for an artist who I had lobbied with Casey on getting to attend because I felt he would be a successful draw to the event. I can't help but feel a little slighted for his lack of appearance, but I probably don't know the entire story of why he didn't show. 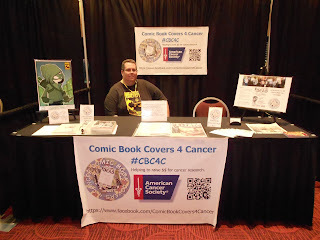 Even though I had a booth, I was able to make my way around the event and connect with many of my friends and artists who I have met through CBC4C. We were even fortunate enough to have a new contributing artist join the ranks of CBC4C, Neil Jorge. He picked-up a Princess Leia blank from our booth on Saturday, and by Sunday was donating a wonderful new cover. One of my personal highlights of the event was a specific costume worn by a lovely woman. She dressed as the dragon Tiamat from Dungeons and Dragons. Those loyal readers from my RPG4EVR blog know that I have had a fixation on Tiamat ever since I was a child and watched the old D&D cartoons on Saturday mornings. 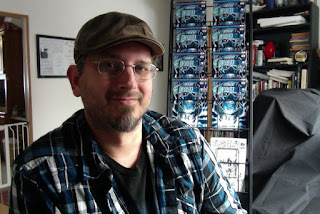 Although I am no good at taking pictures at events, I was able to find a great photo from the Statesman Journal website when they posted an article about the first day of Northwest Comic Fest. Through the 2-day event, I was able to meet with so many people and tell them about our cause. I was able to connect with some old friends who I haven't seen in a very long time, and I even made a few new friends. All-in-all it was a good event. We were able to spread the word about Comic Book Covers 4 Cancer and received several donations to help support the cause. Now that I have this extra experience, I not only hope that we can do it again for next years event, but I am also eyeing the possibility of asking for a table at next year's Cherry City Comic Con.